- To encourage individuals with excellent academic credentials to lead and participate in research initiatives that will contribute to the advancement of the universities' reputation in research and innovation. 2. Obtained A or A+ in the following core subject: Bahasa Melayu, English, History and Mathematics. 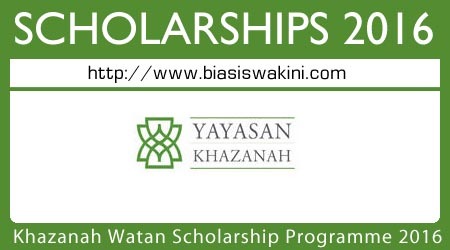 0 Komentar untuk "Khazanah Watan Scholarship Programme 2016"